Today was a great day. The weather here on the central California coast has been very pleasant for the last few days. Today was no exception to that condition. My appraisal business has been on the rise lately. The caliber of cars and locations I’ve been looking at have been taking me to many of the gated communities that have become quite popular. I had an appraisal appointment in Salinas, Ca. in another gated community this morning. 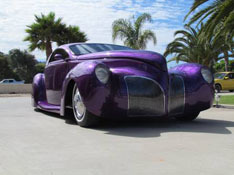 The customers car is a “clone” of a famous custom ’39 Lincoln Zephyr. The customer had a concept in mind and this body kit fit very well with his plan. He went on buy a complete chassis package and marry the two into the stunning custom seen here. The customer along with friends and other professionals in the body and fender trade massaged the kit body to have the outstanding purple creation shown here. As I was leaving following the appointment down the street I spotted a more traditional Hot-Rod in front of a neighboring home. I slowed for a better look and a fellow waved and said hello. I stopped to say hello and provide a business card for my appraisal service. As it turns out the six car garage at this house is actually a hot-rod custom car shop! The fellow introduced me to owner chief builder and showed me around. On the lift was a Ford sedan hot-rod the shop owner has had for over 50 years! It is a state of the art hot-rod with an “old school” Hemi engine! To say that I was amazed to find this shop in the middle of a upscale gated community just begins to describe how I felt. Today was a good day to be me.